I came across a healthy blueberry muffin recipe that sounded delicious, but like most recipes I try to bake at home, it needed “Sennetizing.” What does that mean? Making it even healthier and making it even more delicious. 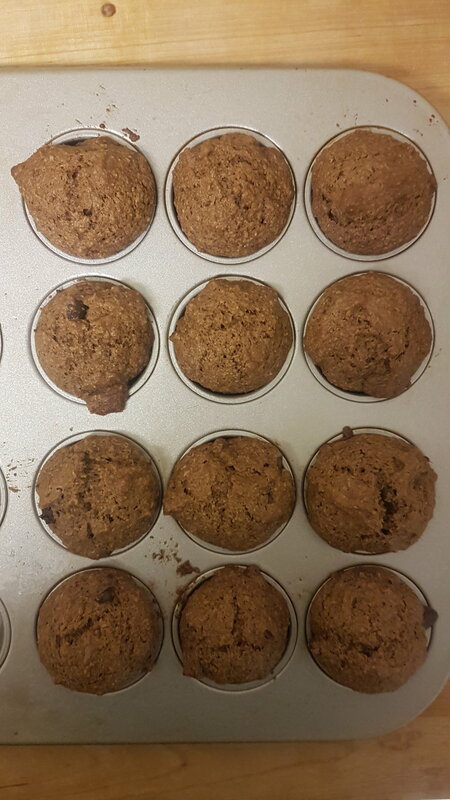 The original recipe for “Blueberry Muffin Tops” (Credit to Norene Gilletz, found in her cookbook: Norene’s Healthy Kitchen) on the top, and Sennetized chocolate chip muffins right below. In a small bowl, mix the 1 tbsp of flax with 3 tbsp of warm water and set aside for 5 minutes. Blend the oil, (flax) egg, banana and vanilla using a cuisineart or hand blender. Look for a smooth consistency. Add the sugar and blend. In a separate bowl, sift together the oat flour, flax meal, baking soda and baking powder. Blend dry mix into the wet bowl and give a quick blend. It’s ok if it’s a bit chunky. Add the chocolate chips or blueberries. I use a mini muffin tin to make approximately 16 treats. But make them as big or as small as you see fit. Bake under 350 degrees for about 15 minutes. Why some of these switcheroo’s? On the flour front, I prefer subbing in lower glycemic, higher fiber bases when asked for nutritionally void, all-purpose, whole wheat or white flour. Besides, oat and flax also lend a nice, nutty flavoring that regular flour doesn’t. For sugars, this is obviously a sticking point for me. Our products all utilize zero glycemic impact sweeteners, but I recognize that these can be both expensive and sometimes hard to find. When in doubt, use coconut palm sugar. Every grocery store that sells regular sugar will also sell coconut palm sugar. It’s not as expensive as other alternatives, it has a glycemic index of 35 (whereas table sugar is 65) and quite simply has a delicious flavor that is all natural. No matter what a recipe calls for, I always reduce it by at least 33%. Try it - you will not miss the extra, unnecessary sweetness. For oils - long standing debate about canola oil (vs. coconut, or sunflower or other sources of fat) that I’m not going to get into. There’s no judgment from me either way, I just happened to have sunflower oil handy. What I will say is that a recipe almost always has too much oil (sort of like sugar), so when baking at home, I like to sub in unsweetened applesauce or a banana. You get added nutrients and a natural moistening agent with much less fat. Finally - the binder. Eggs are a naturally fantastic binder. If you prefer sticking to an entirely plant-based snack, 1 tbsp of flax meal mixed with about 3x the amount of warm water that is allowed to sit and thicken up for about 5 minutes will provide a vegan, starchy binder that works just as well sans the cholesterol. Again, no judgment either way - entirely your call. So that’s about it. Flax and coconut palm sugar are the replacement staples to keep in the house in place of flour and regular sugar. Just swapping in those ingredients 1:1 for the original ones will give your treat both a nutritional boost and a flavor jolt. Does Pleasure Come at the Expense of Happiness?